I've tried over the weekend to get the two monitors up and working with no luck. The problem I'm having is the GUI. I have the dropdown menus on my center display but all mouse actions over instruments and switch won't work in the center window. They do work on the right display. How do I get the mouse actions moved to the center display? Also, it would be nice to find a set of config instructions that applied to ver. 2018.2.2. All that I have found so far refers to editing the preferences.xml file. I set up a separate camera-views.xml file and tried to include it in the rendering tag <rendering include="camera-views.xml"> but the interpreter would not pull that file in. In other words I couldn't get the include to work. Among other things I'm a php programmer so the tags and their structures are understood. I never thought setting up additional monitors would be this difficult. georgem1956 wrote in Tue Sep 04, 2018 11:06 am: Also, it would be nice to find a set of config instructions that applied to ver. 2018.2.2. All that I have found so far refers to editing the preferences.xml file. georgem1956 wrote in Tue Sep 04, 2018 11:06 am: I set up a separate camera-views.xml file and tried to include it in the rendering tag <rendering include="camera-views.xml"> but the interpreter would not pull that file in. In other words I couldn't get the include to work. Can you share your camera-views.xml file? If you place it in the data folder of your installation, it should just load fine in the way you described, so I expect something 's off in the file itself. You might want to look at my file for connecting 5 screens. It consists of one window with four camera's for the 4 main screens, set up in a 2 x 2 arrangement, with a 5th screen at the right of the top screens. (Photo see below). This file has been written specifically for the 777, as it has an offset pitch for the normal view, which requires both an adjusted pitch and roll when you adjust the heading for the side screens (not needed when you place them in one plane). The file above is for the 5 right screens, with the viewpoint just behind the yoke, about 85 cm from the screens. Hi Bel, be glad share the file with you when I get home from work. Nice work on 777. A380 started me on this. I'm working my way up from the 172 Skyhawk...would like to learn the A380 one day...Love your cockpit! Here's something I came across that kinda makes sense. Right now I have all 3 monitors set as an extended desktop. I saw a reference of making them independent displays instead. Does that make any sense? Hi Bel, I need a simple 3 horizontal screens for the 172 skyhawk. I'm trying to modify your file for this. I'm trying to get an understanding of how it works. The include now works by the way, so moving on, "I have one window with 4 cameras". The window name is FGFS multiscreen and to connect the cameras to that window each has that name, right? Display and screen number, is that the point of origin for the window? Does it expand from that point to the other screens? I don't understand what viewport is. When loaded the image spans all three monitors however the cockpit start at the left most side and is very zoomed in so that all I see is the instrument panel. my displays are set as 2-1-3. In this config my mouse will span all displays starting from center and moving both left and right. I have 1 set as my main display. Should it be 1-2-3 ? Also is the order of the "cameras" in the main window important? What designates which camera occupies which display? Here's the config I have so far. Ok. Wish I had any idea why this is but in my current configuration of 3 cameras in a camera group I found that the first camera, the top most camera definition <camera>blah,blah,blah</camera> is the one that contains the mouse mapping/rollover layer. God! I spent the last four days trying to implement a 3 monitor system and from the start I've been chasing this damn mouse problem. I had the 3 windows working except for the mouse. I couldn't start the 172, couldn't find the keyboard mappings for priming, turning on the battery, etc. 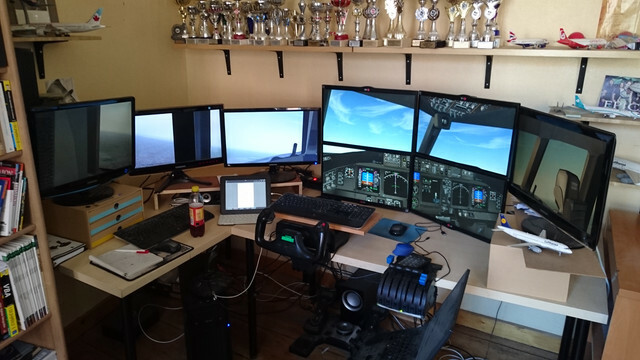 I tried many different ways to show flightgear on 3 monitors and every one of them the mouse didn't work, until I had an epiphany. Dumb luck it what it was. I mocved the camera order around with center display as the center camera definition, right display right cam and left cam left display. Up until then the right camera had always been on top and that was the display the mouse worked on, until..........I happened to move the left camera config to the top of the three and what do you know, the mouse control flipped to the left display. Damn 5 days messing with this...5 days! Sorry for making you wait so long. I 've had one hell of a week and didn't find time to check the forums thoroughly. I hope you're not too frustrated now. The FG-multiscreen system is VERY flexible, you can literally do everything with it, but it's not userfriendly, as it looks you have found out yourself. I 've been struggling for 3 years before I somehow got some insight in the system. I 'll try to explain everything to you. <!--This defines the place in the window where the camera should be drawn. x 0 is at the left side, y 0 is at the bottom. You mesure this in pixels. So if you have 3 screens of say 1920 x 1080 pixels, arranged in a 3 x 1 setup, your window definition should be 5760 pixels wide and 1080 pixels high. The origin of your left camera would be <x>0</x> <y>0</y>, the center camera's origin would be <x>1920</x> <y>0</y> and the right one would be <x>3840</x> <y>0</y>. <!--These x, y and z coordinates define the origin of the camera in the simulator, compare it to the position of the eye of the pilot who is watching and drawing everything in the cameras. <!--Here comes the magic. I'd suggest to start with a setup where the screens are arranged in one plane, so you don't have to modify the heading, pitch and roll values, and leave them all at 0.
offset screen. Make sure all your screens are perpendicular to your line of sight, otherwise you 'll have issues. and the point at your screen that the perpendicular line of sight to the screen falls upon. I'll call this the center-point below. It's the point that is straight in front of your eyes. I hope I 've helped you out a bit. It should be much clearer if I can draw this all down, instead of just trying to explain it in text, but I hope this gives you some insight in the logic.